FAYETTEVILLE, Ark. 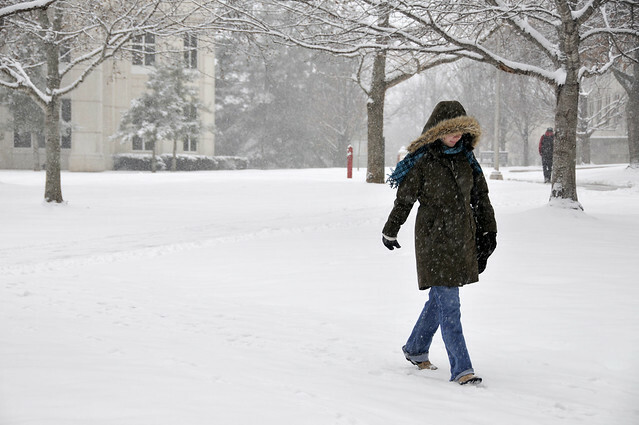 – When wintry precipitation creeps into the forecast, shovels should be the first choice for keeping walkways safe and slip-free, say water quality experts for the University of Arkansas System Division of Agriculture. The National Weather Service offices in Tulsa, Oklahoma; North Little Rock and Memphis, Tennessee; were forecasting a mixed bag of wintry precipitation for Thursday evening through Friday. A winter weather advisory was in effect until noon Friday for Clay, Craighead, Crittenden Cross, Greene, Mississippi, Poinsett and St. Francis counties. “Applying, salt, chemicals and sand to sidewalks, driveways and parking lots can harm the environment once the snow melts and becomes runoff into creeks through storm drains,” said Jane Maginot, Washington County extension agent for the Division of Agriculture, part of the “Know the Flow” stormwater team at the Washington County Extension Office. “The first course of action would be to try and avoid putting anything down when possible,” she said. Shovel. Clear walkways before snow turns to ice. Apply salt only if needed. Select. Salt doesn’t melt ice below 15 degrees Fahrenheit. Use sand for traction when it’s too cold, or a different de-icer. Scatter. Use salt only where critical. Aim for 3 inches of space between salt granules. Sweep. Clean up any leftover salt, sand and de-icer to save and reuse as needed. Enjoy. Enjoy winter weather knowing you did your part to keep walkways and creeks safe. For more information about water quality, contact your county extension office or visit www.uaex.edu/stormwater. Look for tips on stormwater quality on social media with the hashtag #KnowTheFlowNWA.